Looking for a tasty snack to keep you fueled throughout the day? 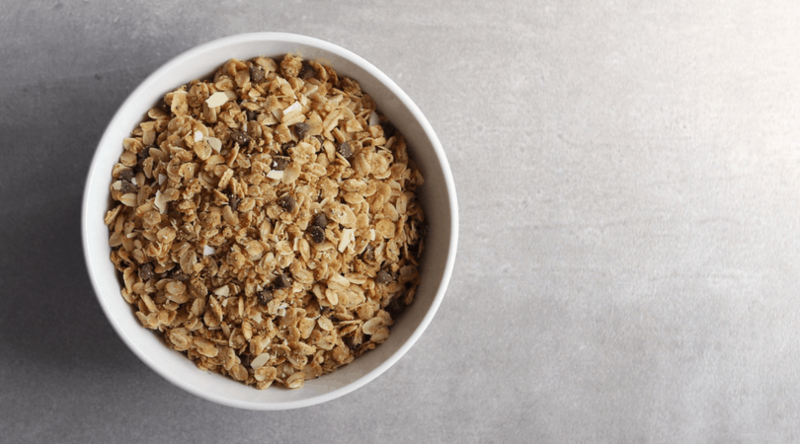 This low FODMAP stovetop granola is filling, delicious, and doesn’t need to be refrigerated, so it’s a great option for days you’re on the go. Pack a few handfuls in a Ziploc bag and you’re ready to hit the road, the trail, or wherever else your day takes you. This stovetop granola is perfect for summer because it’s made in a saucepan instead of the oven. It also has a delicious, sweet flavour perfect for parfaits and ice cream sundaes. Both of which are a staple of my summer. If you prefer savoury granola, make sure to check out my low FODMAP crunchy granola recipe. I like to use chocolate chips in this recipe (because I put chocolate in everything). But if you’re feeling a little more mature, you can swap them out for 1/3 of a cup of dried cranberries. According to the Monash app, dried cranberries are low FODMAP in servings of 1 tbsp per serving. 1/3 of a cup works out to works out to 1/2 a tbsp per serving, which is well within Monash’s recommended range. Think this low FODMAP sweet granola sounds great, but you don’t have time to try it now> Don’t worry. You can PIN THIS POST for later. This low FODMAP stovetop granola is the perfect snack on a busy day. Check out the notes below for tips on keeping this recipe FODMAP friendly. First up, oats. According to the Monash app, oats are safe in servings of 1/2 a cup. Servings of 3/4 cups or more are high in the FODMAPs fructan and galactan (GOS), so measure your serving carefully. This recipe uses 2 cups of oats, which works out to 3.2 tbsp per serving. This is well within the recommended range. Remember, unless you have celiac disease, you don’t need to use gluten-free oats. Gluten is a protein and it can cross-contaminate other products while FODMAPs are short-chain carbohydrates. FODMAPs don’t contaminate other foods in this way. This recipe also uses butter. Even though butter is technically a dairy product, according to Monash, butter is low FODMAP (because it’s all fat). This means you don’t need to use a lactose-free butter during elimination. Most granola recipes call for honey because it makes a great binding agent and it adds a delicious sweet flavour. Since honey is high FODMAP, we’ll be using a cane sugar syrup. You can grab my recipe here. Since table sugar is low FODMAP, this cane sugar syrup won’t add any FODMAPs to your granola. We’ll also be using chopped almonds. The Monash app says almonds are safe in servings of 12 g (about 10 nuts). Servings of 24 g or more are high in the FODMAP galactan (GOS). This recipe uses 1/2 a cup of almonds, which works out to 7 g per serving. This is well within the recommended range. Last but not least, chocolate chips. Normal chocolate chips have too much lactose to be FODMAP friendly. Some brands also add wheat and high FODMAP sweeteners to their products so make sure to check the labels carefully. I use Enjoy Life vegan chocolate chips. I like them because they’re nut, wheat, and lactose-free, but they still taste fantastic. Want to try this low FODMAP sweet granola? Don’t forget to PIN THIS RECIPE for later! Need a FODMAP friendly snack to help you power through your day? 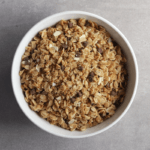 Try this low FODMAP stovetop granola. Add the oil and oats to a medium-sized saucepan and toast the oats until you can smell them (3-5 minutes). Once toasted, spread the oats out on a baking sheet to cool. Melt your butter in the same pan over medium heat, then stir in the cane sugar syrup and brown sugar. Stir constantly until the mixture bubbles, then return the oats to the saucepan and stir them for another 5 minutes. Once the oats are coated with the sugar mixture, spread them out on the cookie sheet again and allow them to cool. Then add the chopped almonds and chocolate chips. Store in an airtight container at room temperature. 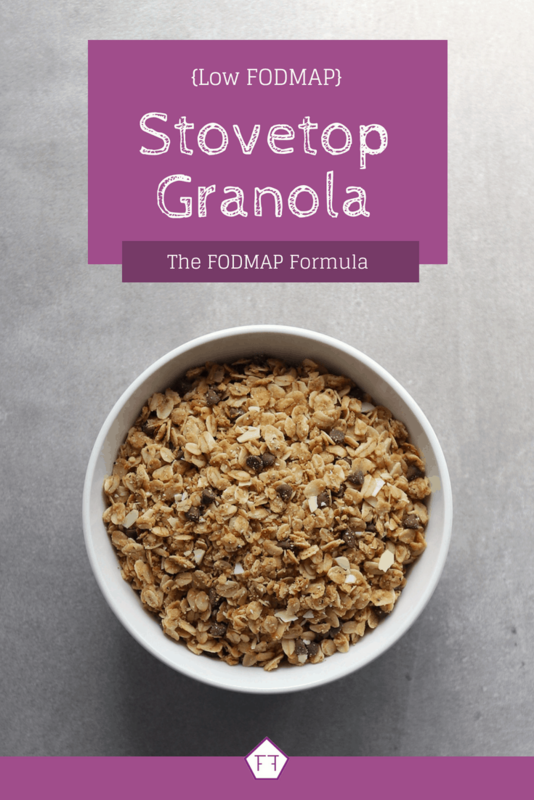 This low FODMAP stovetop granola is a tasty way to refuel throughout the day. If you like this recipe, make sure to sign up for my mailing list below. You’ll get new low FODMAP recipes and articles delivered right to your inbox. Want more inspiration? Follow me on Pinterest for even more FODMAP friendly ideas. Together we’ll get the Low FODMAP Diet down to a science!